The Diagnostics by Design hackathon was designed as a cross-communities effort to bridge the gap between makers and do-it-yourself innovators and the sphere of global health. The event posed a challenge to participants: with minimal materials or through innovative coding, tackle a technological or informatic need in the space of point-of-care diagnostics. On Saturday, January 11, attendees from the Maker community, bioengineering graduate students, medical doctors, engineering professionals, and public health students met to form teams and flesh out project ideas. With participants from academic and professional spaces, the goal was to provide an interface between the innovative expertise of the former with the needs assessments and field knowledge of the latter. Participants not only had the opportunity to explore global health challenges, but got hands on experience with pressing health and design needs. 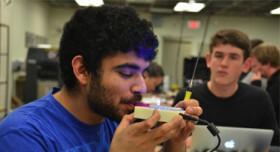 On Sunday afternoon, after about 18 hours of building, five teams emerged to present their ideas to a panel of judges. The final winners included a modified bug zapper that specifically attracts, kills, and counts mosquitoes harboring the deadly malaria parasite, a simple, low-cost vision screening tool, and a simplified spirometer to monitor lung function in populations with high pollution exposure. For more information on events related to global health diagnostics and technology innovations, please visit our Global Health Diagnostics (GHDx) page. 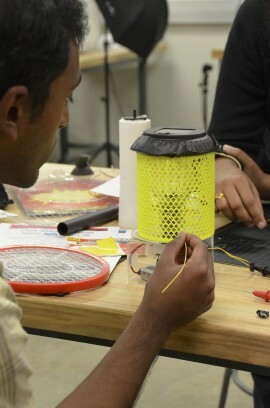 First prize team, M@RS, developed a modified bug zapper for malaria mosquito monitoring.